Some of the most eye-catching designs I’ve seen on a well-dressed table lately involve the humble salt and pepper shaker. Many of them aren’t even recognizable - at least, not until you see the familiar holes on top. They boast impressive styling (and often, prices to match). 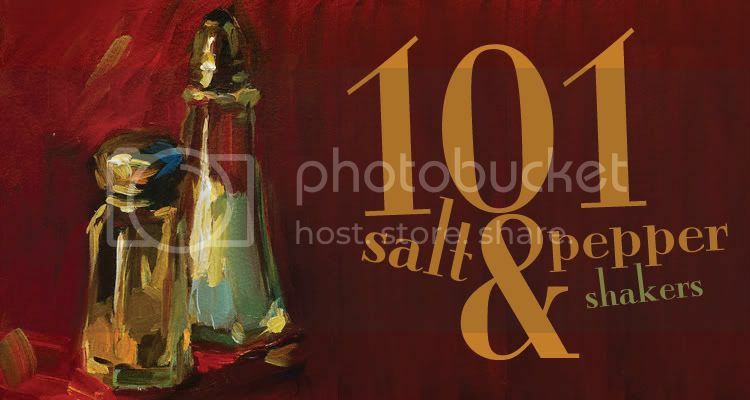 Serve up your salt in style and pour on your pepper with panache. With 101 designs indicated below, I’ve given you plenty of choices that sprinkle with sass. Bon Appetit! (above: 1-5: Fitz and Floyd Ricamo, 12.50, Macys; Gallus rooster, 195.00, Lladro; Springtime, 125.00, Vivre; Chicken in Basket, 14.95, Surlatable; Birds 50.00, Gracious Style). (above: 6-11: Clown fish, 75.00, Gumps; Owls, 18.00, Anthropologie; Monkey 7.99, Target, Stags, 22.00, Well Dressed Home, Cats in Garden 10.00, Gifts from a Distance; Frogs, 11.95, Sur la Table). (above: 12-17: Stacking pots, 25.00, A plus Store; Salt and Pepper set 100.00, Georg Jensen;, Magppie salt and pepper set, 79.00, Home Couture; Salt and Pepper set, Magenta, Alessi Pepe le moko, 118.00, Abitare; Hug, 25.00, Greener Grass Design). (above: 18-23: Stoneware, 18.00, Le creuset; Sigaliot, 25.00, Etsy; Sea blue baby tagine, 24.00, World Shoppe; Red Berry Bodo Sperlein 46.00 Tart on the Web; Nettuno Coral, 39.00, Vietri; Red salt and pepper, 22.00 Fiesta). (above: 24-29: Fruit Haven, 28.50, Spode; Artichoke, 125.00, Vivre, Artichoke, 14.95, Sur la table; Florentine, 7.99, Target; Pineapple, L’ Objet; Pumpkin Gourd, 14.95, Online Discount Mart). (above: 30-34: Chinoiserie gazebos, 30.00, The Source Perrier; Pagoda Pearls and Swarovski, 175.00, L’ Objet, Pagoda, 250.00, The Silver Gallery, Chrysler building, 40.00, New York Library Shop; Beehive 20.00, Kristen Grace). (above: 35-39: Martha Stewart Everyday Golden Wreath, 5.99, Kmart; Tse Tse Poivriere, 52.00, Fitzsu Society; Crystal Spice, 95.00, L’Objet, Turtle Spice Jewels, L’Objet; Jeweled birds, 595.00, Jay Strongwater). (above: 40-46: Jeweled ice round, 24.99, Lenox; Magnolia, 29.00, Arthur Court; Lauren Walker, 49.99, Macys; Kalliste, 206.67, Artedona; Waterford 135.00, Saks Fifth Ave; June salt dish by William Yeoward, 130.00 william Bloomingdales; Montana, 10.00, Pottery Barn). (above: 47-53: Ghost and Skeleton, 7.98, Lillian Vernon, Woodland 48.00, Spode; Winter Greetings, 46.00, Lenox; Kissing Snowpeople 11.99, Yahoo store; Turkey, 49.99, Dinnerware Depot, Christmas tree, 30.00 Spode; Holiday, 45.00, Lenox). (above: 54-59: Axel mill, 195.00, Fitzsu Society, Fluidform Serene Dusk Dawn Mill, 110.00, Charles and Marie; Empire, 21.50, Pfaltzgraff; Wooden, 12.95, Crate and Barrel; Palm Wood, 9.07, Patina Stores, Shells 450.00, Verdura). (above: 60-65: Kuchengnomen, 43.00, Cake; Lotus Pod, 56.00, The Home Port; Twist, 79.00, Nambe; Ypsilon, 116.25, Artedona; Cubus, 110.51, Artedona; Define Curved, 14.99 pounds, Barfly). (above: 66-72: Baby Crocodile, 475.00, Tart on the Web, Vertigo, 160.00, Vivre; Twist, 130.00, Georg Jensen; Stainless Steel Trudeau, 16.50, Klinq; Galet, 157.87, Artedona; Kate Spade Library Stripe, 40.00, Michael C. Fina; Lighthouse, 47.00, Mariposa). (above: 73-79: Taste of Talking, 22.00, Charles and Marie; Wooden Block, 7.95, Patina Stores; Rack’em Up, 5.99, Wrapables; Coke Contour, 17.50 pounds, Happy Days; Pig, 65.00, Uncommon Goods; Lola Goldstein, 22.00, MoMA). (above: 80-87: Leaf, 20.00, Michael Aram; Gothic, Magenta, Sea Urchin, 85,00, Tiffany and Co.; Juliska, 49.00, Lille Shop; White salt and pepper set, 14.99, Joanne Hudson; Luminous, 4.00, Pier1, Kate Spade, 88.00 June Lane, Bloomingdale’s; Classic Century Eva Zeisel, 36.95, Crate and Barrel). (above: 88-93: Studio Cellars, 10.00 Pottery Barn; Birds, 48.00, Jonathan Adler; Artisan, 6.99; West Elm, Shake-a-leg by Perch, 48.00, Velocity; Butlers Pantry, 29.00, Lenox; Natural Capiz, 12.95, Zgallerie). (above: 94-101: Caddy, 205.00, Match, Arte Italica salt and pepper, 108.00, Bloomingdales; Michael Graves, 159.00, Alessi; Stainless Steel 15.00, Pier1, Mini evolution by Trudeau, 66.00, Klin; Salt shaker and Pepper mill Brilliant, 25.00, Klinq; Acorn, 45.00, Gracious Style; Castors 60.00, Georg Jensen). I must confess that I boast a very modest set of s&p ... which I keep hidden until an occasion arises that they are beckoned... but your well-edited selection here has me in a pickle trying to choose which would best suit my own table... in full view... Bravo to you on this post. Walking to work today I thought to myself, "Man, I really hope Toast and Tables does an entry on Salt and Pepper shakers!" That's 100% true! Oh yes, I love unique salt and pepper shakers! Great roundup of some fun and classic ones! Danielle, I hope this post inspired you that you can show off your salt and pepper shakers with style! No need to keep them behind closed doors when they look this beautiful. K, the baby crocodile s/p shakers are ah---mazing! I can only dream of the day when I will be able to afford to put $475.00 "shakers" on my table; but a girl can dream right! Allison, didn't you know I have ESP (ha! ha! ha!). I'm so glad that this post added some "spice" to your day! Thanks Teresa! I wanted to provide choices, choices and more choices. I'm in love with those blue tagines. oh my ~ what a collection! my grandma would've gone crazy for this post (god rest her soul). she had a huge salt-n-pepper shaker collection. thanks for the amazing research & variety you've brought for our visual splendor. Great post. We've actually had a hard time on this element in doing our registry, and this helps! These innovative styles, colors and materials are adding some spice to the otherwise plain 'o salt and pepper shakers. This list was so fun to make and I have so many favorites that I wanted to share. SW, your grandmother had the right idea - - - just start a collection! Thanks Ladies for stopping by. Fantastic post! I collect salt and pepper shakcers on my travels, but love some of these you have posted--especially the architectural ones.